Aileen Bautista – At a very young age, Aileen used to volunteer cutting and coloring family member’s hair just for fun. 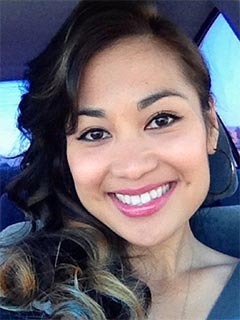 Aileen had the opportunity to attend Paris Beauty College in Concord, CA during high school. She was licensed 1999, landed a job soon after and started her career right away. She realized her passion for hair wasn’t just cutting and coloring, but it’s a work of art. Although she works behind the chair at Red Union Salon, she is a member of ICU Networking Club based in San Francisco. She helps with different hairstyles for fashion shows which some are with local clothing designers. Aileen works with independent photographers for photo shoots and freelance doing hairstyles and makeup for wedding parties all over East bay and San Francisco. Services she offers are haircuts, coloring and highlighting. One of Aileen’s specialty is up-dos which she has been doing for over 10 years. She is also certified in Brazilian blowout and Simply Smooth Keratin Treatment, which helps repair dry damaged hair. Color line that she works with are Redken, Framesi and Joico. To name a few hair products she uses are Pureology, UNITE, Aquage, TIGI and Minardi. Aileen believes beautiful hair is healthy hair.